Dodge will resurrect the Dart name for its new Alfa Romeo-based compact car, set to debut at next month's Detroit Auto Show. The Dart will be the first Alfa Romeo-based Chrysler production car introduced in the United States. Arrivederci Caliber! Based on Alfa Romeo's Giulietta platform, this spawn of the Fiat-Chrysler merger's going to be Chrysler's first decent attempt at winning over the ever-expanding compact space since the Dodge Neon. Chrysler's promoting heavily the Dart's Alfa-underpinning as a way of saying "we know we haven't built a good compact car in more than a decade." The two images we have show an aggressive, Charger-derived appearance that's a large departure from the Giulietta. Not surprisingly, Chrysler calls the American version the "Compact U.S. Wide" architecture, which is to say the Guiletta has been widened for fat American butts while retaining the Alfa's four-wheel independent suspension. It's also been turned into a sedan instead of a five-door hatch. Power will comes from a choice of three engines: a "Tigershark" 16-valve 2.0-liter engine, a 16-valve 1.4-liter MultiAir Turbo engine (similar to what's found in the Fiat 500), and the "Tigershark" 2.4-liter MultiAir four-cylinder. There will be three transmission choices as well (some combination of manual and automatic). We hope the most powerful engine is tied to a six-speed manual transmission in the R/T model pictured above. 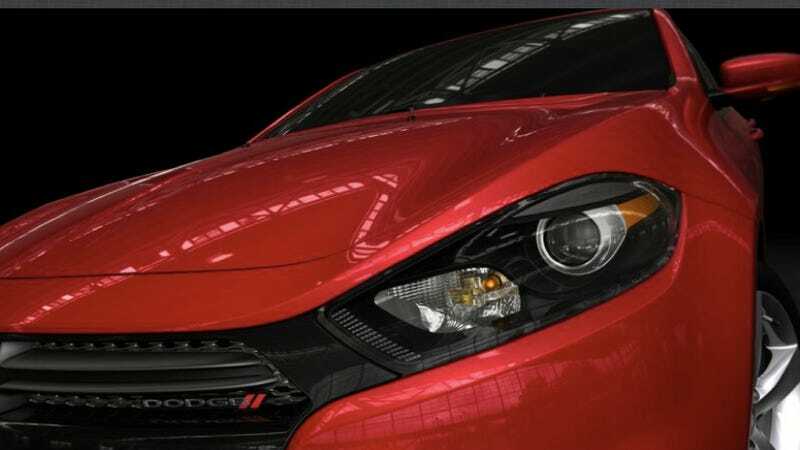 Chrysler also says the new Dart will be built in the company's Belvidere Assembly Plant in Belvidere, Illinois.